SCHULTE infra red radiation heaters work on the same principle as the Sun - more cost saving than the traditional heating systems. Spaces are heated by radiation, not by convection. 1. Up to 30% savings on energy costs. 2. Environmentally friendly, 33% less CO2 emissions (compared with conventional heating). 3. No air flows mean no raising of dust. 4. No risk of freezing, minimal noise. 5. Uniform heating of very large areas. GRUP ROMET provides designing, installation, commissioning, periodical technical inspections and operation authorization, service, being ISCIR certified. Turbo 150 SCHULTE - etastar infra red heating system is designed for halls of min. 6 m height, with big heating needs, where the radiation of the normal etastar is not sufficient. Turbo 200 SCHULTE - etastar infra red heating system is designed for halls of min. 6 m height, with big heating needs, where the radiation of the normal etastar is not sufficient. 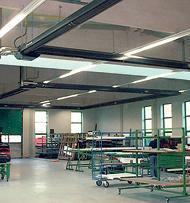 SCHULTE - maxistar radiant strip is designed for halls of more than 8.5 m height. SCHULTE - minitemp radiant heating system is designed for 3-5.5 m high halls, built in accordance with the new thermal protection regulations. The heating unit is made of modules (3 and 6 m long), coated on sides with heat resistant paint (RAL 7016). SCHULTE - ministar radiant heating system is specially designed to meet both financial and technical or design expectations. It is based on a simple functional structure.